These sheets are 432 x 685mm each, and are packed flat. Each pack consists of 480 sheets. 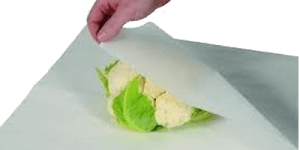 Greaseproof Paper Sheets are used for packaging oily foods or objects with excess liquids. They assist in keeping food fresh by allowing it to breathe and is used for lining and separating biscuits, chocolates, wrapping cheese and even flowers. The sheets are 432 x 685mm each and are packed flat. Each pack contains 480 sheets. Our Greaseproof Paper Sheets will ensure a grease free, attractive form of packaging without the mess.